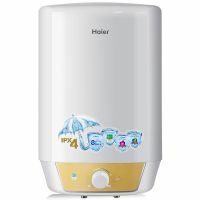 ES25V M3 geyser water heater 15 liter Capacity with ABS Outer Body. It's 8 Rated Pressure (Bar) and Safe Care Technology. This water heater comes with 5 Star Rating (BEE) and Heating Element Incoloy. RSC technology ensures consistent flow of hot water through circle-rounded structure of the inlet tube. To Recieve updates and possible rewards for Haier ES25V M3 please sign in. To Recieve updates and possible rewards for Geyser/Water Heater please sign in.